Dog (greyhound) shaped handles are fairly common on Derbyshire made brown saltglaze and less so from elsewhere. I haven&apos;t yet determined their earliest appearance but animal handles (foxes and salamanders) are found on English white saltglazed sauce boats from the mid 1740s. The first dogs seem to be on moulded jugs from the Staffordshire firm of Phillips & Bagster (1818-23). The 1912 Denby catalogue has dog handled jugs costing about 12% more than plain handles and loving cups, tygs and large tankards were ONLY available with dog handles. 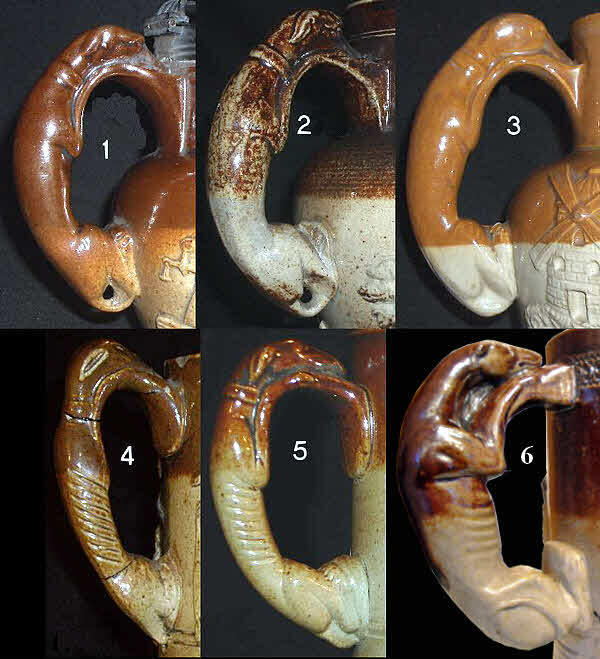 The 1873 Doulton and Stiff catalogues make no mention of dog handles but they are found on loving cups and tygs. Similar products from Bristol (late 19th century?) and Thomas Smith have been recorded. As can be seen from the illustrations the London dogs are all very similar but it may be possible to distinguish between Denby and Brampton/Chesterfield.